Several years ago, I had the honor of representing another Huntsville personal injury attorney who was hit by an SUV while riding his bicycle. After the crash, the SUV driver paused just briefly to see that the bicyclist had lived. Then, he fled the scene. He was never identified. The bicyclist suffered a severe neck injury. I was honored that he asked me to handle his case. This injured attorney had been practicing trial work for years and knew lawyers across northern Alabama. 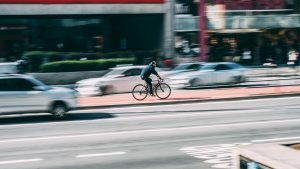 Because law enforcement was never able to identify the driver who caused the crash, we pursued claims against the bicyclist’s insurance company for uninsured motorist benefits (UIM). Let this be a lesson to everyone — It is very important for you to have UIM coverage on your policy. You can read more about that issue in a special section of our law firm website. In the lawyer bicyclist case, we worked with the medical professionals to present the evidence of his serious injury. When the insurance company refused to fairly evaluate the matter, we went to trial. We successfully won a verdict compensating him for his full damages. I think of that case every time I read about hit and run incidents involving pedestrians or bicyclists. I also think about the Pokemon fad. I can remember leaving my Huntsville office at night during that ridiculous fad. As I drove through downtown, I would see people staring into their cellphones while walking. Often, these people would cross streets with zero awareness of the traffic around them. How dangerous. Are hit and run accidents increasing? According to research, they are. CBS News recently aired a good story on the increasing problem of hit and run deaths across the United States. In Huntsville, our city has done a wonderful job incorporating bicycling areas. Our city planners have actually worked to develop a traffic plan that tries to incorporate pedestrians, cyclists and future public transit growth. The City recently published a brief article on the issue titled Building better mobility with Complete Streets. Just a couple blocks from my office, the City recently redesigned some downtown streets with dedicated cycling/walking lanes. Here is a brief article on that development titled Pedal Pushing: Spragins cycle track opening is first step in Bigger Picture. These developments are an important piece of what makes Huntsville such a great place to live. But, they also require drivers to have a heightened awareness that they share many roads with others. Alabama has several statutes dealing with the rights and duties of bicyclists. To a large degree, bicyclists share the road and they share the rights of other motorists. The problem is that many motorists fail to be aware of the nearby cyclist. Add to that the huge problem with distracted driving in general and you have a significant danger for bicyclists. We also have several statutes dealing with pedestrians which I think are rather unfavorable to the pedestrian but that is another topic for another day. Driving requires constant attention. And, driving requires us all to appreciate and respect others around us. As the number of pedestrians and cyclists in our communities increases, we need to work harder so everyone can share the road safely. At the Blackwell Law Firm, we represent people who have suffered a serious personal injury. Many of these personal injury cases involve automobile accidents. We frequently discuss topics related to car and truck safety in this blog. From our office in Huntsville, we represent clients across Alabama.